2019 dated digital planner for GoodNotes, Notability, Noteshelf and other iOS and Android apps. Hyperlinked monthly and weekly spreads, daily appointment agenda, 14 tabbed sections and multiple paper styles - PLUS 150+ stickers included - all Pre-Cropped and ready to use, no messing around with sticker sheets. Signup for the VIP Club and get an exclusive coupons, flash sales & more! 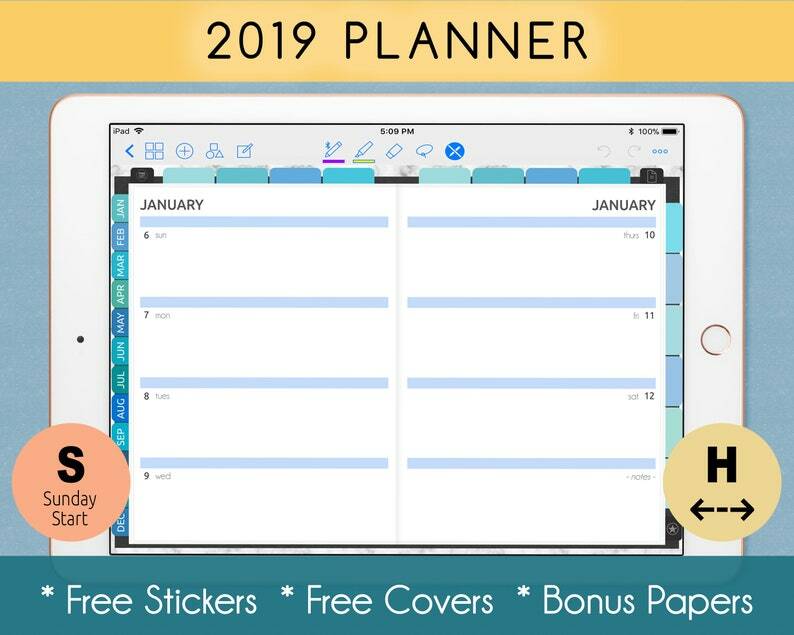 This digital planner with working tabs is perfect for all your monthly planning, note taking, tracking & organizing, self discovery writing, creative drawing & sketching, even dream journaling! Includes digital paper with dot grid pages for your bullet journal trackers, quadrille graph pages for math and data charts, and blank pages where you can add additional inserts (sold separately). Create the perfect flexible planner tailor made for YOU! Hyperlinks for months, tabs and quick links all tested and functional in GoodNotes, Notability & Noteshelf apps. Other PDF reader / editor apps may not support hyperlinks. * Hyperlinks for months, tabs and quick links all tested and functional in GoodNotes, Notability & Noteshelf apps. Other PDF reader / editor apps may not support hyperlinks. (1) .goodnotes.zip file to import into GoodNotes. Includes cover, all planner pages and all stickers in one simple download - ready to go! (1) PDF file to import into Notability, Noteshelf or other PDF editor / reader applications. (1) ZIP file with additional covers as both PDF and jpg files. A download link will be available once payment is received. (c)2018 Barbara House / Enchanted Willow. 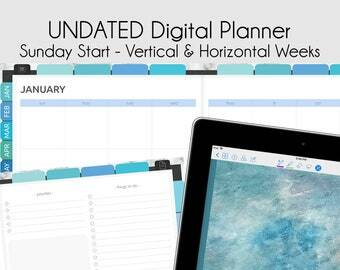 This digital planner is for personal use only and not intended for print production. Commercial Use and Resale are prohibited. File sharing, reselling or claiming the PDF files as your own is not permitted. This is not a physical product. It is a digital download. No physical items will be shipped. All sales final on digital products. I honestly bought this notebook just for the cover. It is to die for!!! You are a wonderful artist. Please release more of your covers as just covers. I would love to buy more but I don't need a notebook with each one :) Thank you for your hard work. All orders are provided as instant download. Instant downloads can be retrieved immediately through your Etsy purchase history. I purchased through the Etsy app - where is my download?